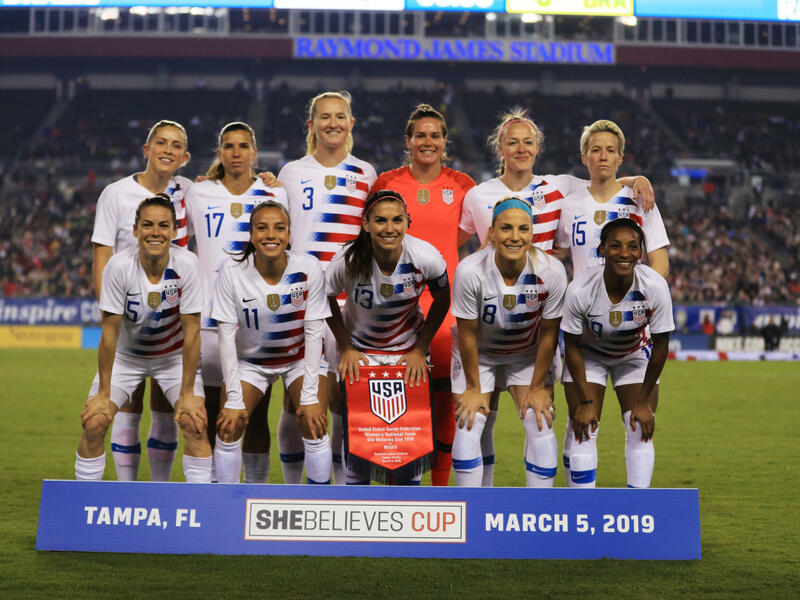 Twenty-eight members of the women's team are named as plaintiffs, including many of the sport's biggest stars: Alex Morgan, Carli Lloyd and Megan Rapinoe. The lawsuit seeks to be a class action, representing other women who've played for the U.S. national team and who may have been denied equal pay for substantially equal work. The issue of unequal pay has been a highly contentious matter in recent years, and the U.S. women's team has kept the pressure on U.S. Soccer. The women's team reached a new collective bargaining agreement with the federation in 2017. Four of the plaintiffs — Morgan, Lloyd, Rapinoe and Becky Sauerbrunn — filed a charge of discrimination with the Equal Employment Opportunity Commission in 2016, on behalf of themselves and similarly situated players. But no progress was made, and last month, the EEOC issued letters giving the four the right to sue. "Each of us is extremely proud to wear the United States jersey, and we also take seriously the responsibility that comes with that," Morgan said in a statement reported by The Associated Press. "We believe that fighting for gender equality in sports is a part of that responsibility. As players, we deserved to be paid equally for our work, regardless of our gender." The filing comes on International Women's Day – and less than three months before the Women's World Cup kicks off in France. The U.S. women's team, currently ranked No. 1 in the world, hopes to defend the World Cup it won four years ago. The U.S. Women's National Team, or USWNT, has consistently been more successful than the men's team. The U.S. women have won the World Cup three times and are four-time Olympic champions. The men's team has never won either tournament and failed to qualify for the 2018 World Cup. Despite their success and popularity, the women are paid less by U.S. Soccer than the men. The lawsuit details how the pay gap plays out in myriad ways: Women's players paid less for each "friendly" match, they're paid less for making the team's World Cup roster, and they're paid much less for their performance at the World Cup. "A comparison of the WNT and MNT pay shows that if each team played 20 friendlies in a year and each team won all twenty friendlies," the complaint says, "female WNT players would earn a maximum of $99,000 or $4,950 per game, while similarly situated male MNT players would earn an average of $263,320 or $13,166 per game against the various levels of competition they would face." In other words, a top-tier women's player would earn just 38 percent of the compensation of a similarly situated player on the men's team. But direct comparisons of compensation between the men and women can be tricky, as The New York Times notes: "Each team has its own collective bargaining agreement with U.S. Soccer, and among the major differences are pay structure: the men receive higher bonuses when they play for the United States, but are paid only when they make the team, while the women receive guaranteed salaries supplemented by smaller match bonuses." The lawsuit points out that for their success in winning the 2015 Women's World Cup, the U.S. women were paid less than a third of what the U.S. men were paid for losing in the Round of 16. The pools of bonus money are meted out to countries by FIFA, soccer's international governing body, but it's up to U.S. Soccer to decide how the money is divvied up. FIFA plans to double the prize money it awards nations at this summer's Women's World Cup, but the purse will still be a fraction of what the men collect. The union representing the members of the U.S. Men's National Team, whose own collective bargaining agreement expired last year, issued a statement supportive of the USWNT's efforts to be paid equally. "Specifically, we are committed to the concept of a revenue-sharing model to address the US Soccer Federation's 'market realities' and find a way towards fair compensation. An equal division of revenue attributable to the MNT and WNT programs is our primary pursuit as we engage with the US Soccer Federation in collective bargaining." The Women's World Cup is less than three months away, and the world champion U.S. women's soccer team once again heads into the tournament ranked No. 1. But the players say there is a problem. They're suing U.S. Soccer, the sport's governing body in this country, over what they allege to be unfair pay and treatment. Joining us now is NPR's Laurel Wamsley. Welcome to the studio. LAUREL WAMSLEY, BYLINE: Thank you. CORNISH: So what does the lawsuit accuse U.S. Soccer of doing? WAMSLEY: So U.S. Soccer is the employer for the men and women who play on the national teams for the U.S. And what the women's team argues is that despite performing the same job responsibilities as the players on the men's team, they are consistently paid less than the men are. And that, they say, is a violation of the Equal Pay Act and the Civil Rights Act of 1964. They want equal pay for equal work. So what they're seeking is an end to these discriminatory practices, they say. And they also want to be paid, and they want to get punitive damages. CORNISH: So when we say they, who are the parties involved here? WAMSLEY: This is the entire U.S. women's team - all 28 players on the team that are in the mix for the World Cup this summer. And they're also seeking this to be a class action lawsuit, so that would cover other women who may have been discriminated against. CORNISH: So do the women get paid less? WAMSLEY: Yeah, they definitely do. So they get paid less for each game they play. That's, like, friendly matches. And they also get paid less for making the World Cup roster. And then they got paid less - way less - for winning the 2015 World Cup than the players on the men's team did for getting knocked out of their World Cup in the round of 16. So it's a little complicated, actually, though, because FIFA in that case is the one that allots the prize winnings to the nations. And that's sort of based on how much, you know, the men's World Cup brings in, which is more than the women's World Cup does. So it's sort of tricky for them to see. CORNISH: So we know the women's team wins on the field. What about the business side? Are the women paid less because they generate less revenue? I mean, you mentioned that when it came to the World Cup. WAMSLEY: So neither U.S. Soccer nor the women's players union has released that sort of financial data. But in the lawsuit, the women's complaint - the women complain that U.S. Soccer doesn't work hard enough to market their team and that it unilaterally decides to charge less for tickets to their games, which depresses revenue. But the team definitely has a following. In the final of the last World Cup in 2015 - when the U.S. beat Japan - that was the most-watched soccer game in U.S. history, men or women. CORNISH: What does U.S. Soccer have to say about all this? WAMSLEY: Well, they told me that they won't comment on existing litigation, but in response to a case in 2016 with similar charges, U.S. Soccer said that any pay discrepancy wasn't on the basis of gender. But they're actually in sort of a tricky spot because it's a World Cup year, and a big part of the messaging around the team is how fierce these players are, how talented they are. And the players have been outspoken on a number of issues, including LGBT rights, police brutality. And they've been especially vocal when it comes to equality for women. At a game just last weekend, the players each wore the name of a different iconic and influential woman on the back of their jerseys. So it also is a little complicated because the current president of U.S. Soccer, when he was campaigning for that job, even said that the U.S. women's team should be respected and valued just as much as the men's teams, but that the female players have not been treated equally. And so some of the top women do get paid more now than they did just a few years ago, but the lawsuit says that U.S. Soccer only pays lip service to gender equality. CORNISH: Do you get the sense that this is a surprise, or is it something that's been brewing for a while? WAMSLEY: I think that U.S. Soccer had hoped that some of this was sort of behind them and that things were not going to be tense going into the World Cup, which starts in June. But at the same time, there was a charge filed back in 2016 that was never resolved. So I think they must've known that there was a chance that this would bubble up again.